Diskussion i 'Oneworld' startad av Dr. Miles, 30 Augusti 2013. Japan Airlines serverar Sorbet&Macaron från Jean-Paul Hévin i First&Business class fr o m 2013-SEP-01. Sorbet serveras i First class och Macaron serveras i Business class. I Mjölksås används bl a Suntory Hibiki 21 years. Tokyo, August 28, 2013:Japan Airlines Co., Ltd. (JAL) and JEAN-PAUL HÉVIN announced today that they would collaborate with world-renowned Japanese master chef, Mr. Seiji Yamamoto and Star Chef, Mr. Chikara Yamada to introduce original desserts from September 1, 2013. These collaborative desserts will be offered as a part of the menu “JAL BEDD-SKY AUBERGE”- JAL’s exclusive restaurant in the sky in First Class and Business Class on Europe, North American routes. “Sorbet Cacao Nature” by Jean-Paul Hévin, which beckons with its mellow cacao flavor atop the rich, aromatic milk foam specially prepared by Chef Seiji Yamamoto of Ryugin. 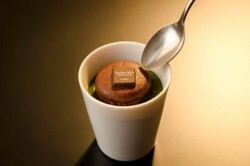 Chef Chikara Yamada's Maccha Mousse specially prepared to harmonize with the chocolate Macaron Amer created by Jean-Paul Hévin. In the bittersweet maccha mousse, a delicacy of hidden accents-chocolate blended with maccha syrup and thin, crunchy cookie flakes.